Could you believe that a surname and the people attached to that name could be ‘banned’? Well, it did happen to the Scottish highland clan surname of MacGregor, including the spelling form of McGregor and Gregor. In 1603 the new king to the English throne was King James IV of Scotland, becoming King James I. Scotland was divided at the time into clan territories. 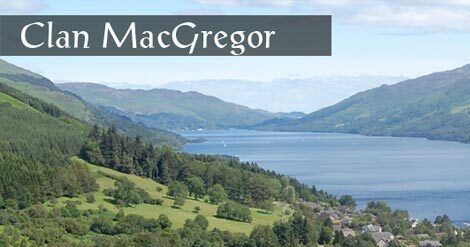 The MacGregor clan lived in a rough, rocky and mountainous region. To survive they many times raided neighboring clans, especially the Colquhoun clan. With permission given in early February of 1603 the Colquhouns gathered forces of 500 men on foot and 300 mounted men and moved north to confront the MacGregors. To fight back 400 MacGregors led by Alister, went south into Colquhoun lands and all met at Glen Fruin on February 7, 1603. 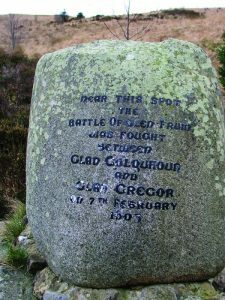 The battle with attacks by the MacGregors from the front and rear produced 200 deaths of Colquhouns and just a few MacGregors killed. The winning MacGregors took horses, cattle and sheep and burned the homes of the Colquhoun families. King James I put out a royal warrant for Alister MacGregor, who was located, arrested along with 17 of his men. After the trial, all were hung. As further punishment, the King ordered on April 3, 1603 that all variations of the MacGregor surname should be “altogidder abolished”. It stated at anyone having that surname would forever suffer the pain of death unless they renounced their birth or married surname. Many quickly changed their surname to Murray, Ferguson, Stewart or Grant. All keeping the MacGregor name were hunted down; men, women, and children. The children were sold as servants and their names changed. The Scottish church did not protect them. They were not allowed to marry. The MacGregor families became known as ‘children of the mist‘ due to the losses of members. This ban of the MacGregor surname continued until 1661 (some 57 years) when it was removed by King Charles II. Then in 1693 the ban was reinstated by William of Orange. It remained in place until 1774 when it was officially and permanently lifted. So check your family tree and see if there were any MacGregor ancestors. Photos: Scottish Highlands for MacGregor; the stone commemorates the 1603 Battle of Glen Fruin between MacGregor and Colquhoun clansmen; and Highlands view.